After a turnaround year that saw a first playoff appearance and a first win over rival Olentangy in his three seasons at the helm, Olentangy Orange football coach Zebb Schroeder has a lot to build on for the upcoming season. The Pioneers made the playoffs for the third time in school history (first since 2011) and earned their second-ever win over Olentangy. Orange came within a touchdown of knocking off its other rival, Olentangy Liberty, on two different occasions last season, falling 20-13 in double overtime in Week 9 and 24-17 in the first round of the playoffs. The Pioneers finished the season with a winning record for the first time since 2012 to mark the end of Schroeder’s rebuilding project. No doubt about it – the Pioneers have arrived. Part of the reason for Orange’s arrival is junior defensive end Zach Harrison. Harrison has been offered by at least 14 Division-I colleges according to a couple of recruiting sites and by as many as 17 according to another. “I think part of what makes him special is what he does from the neck up,” Schroeder said. “One of our core beliefs is if you want to be successful, you have to obsess over the fundamentals … he’s a kid that obsesses over his trade. He studies it, he studies other people (and) he’s worked on it in the offseason. Harrison is not alone. The Pioneers return a star-studded nucleus that helped hold opponents to 17.2 points per game and 265.4 yards per game last season. The linebacker unit is particularly strong. Senior middle linebacker Bryce Houston, last year’s leading tackler, will be flanked by Zane Fisher (senior) and Jack Neer (seniors). Houston has committed to Ohio University. “Every year, (Houston) has made progress and I think he’s got a chance to be one of the really, really great linebackers in the state of Ohio. I believe that,” Schroeder said. Neer is the newcomer to the unit after spending last season on offense. Dominic Davis (junior) and Dylan Buchanan (junior) will see time at linebacker as well. Jack Applegate (senior) and Alex Alasti (senior) provide depth at that position, but will spend most of their time on offense. Jayden Rodgers (senior), who led the team in pass breakups returns at cornerback, and Joel Sarpong (senior), Thomas Sargent (senior) and Robbie Dayhuff (junior) will all see time on the edge as well. Jimmy Sensibaugh (senior), who was third on the team in tackles last year, returns for his third year as a starter at safety. Garrett Runyon (senior) moves back to safety after starting as a corner. Brandon Ransom (senior) and Brian Watson (senior) provide depth at safety. Schroeder sees Jack Houston (senior), Brant Kightlinger (junior), Jadon Matthews (junior), Kyle Sessaman (junior), Zach Hill (sophomore) and Nate Gadrim (senior) all spending time on the defensive line. Gadrim will spend the majority of his time on offense, giving Schroeder a luxury he hadn’t had in years past. His bigs will mostly play one way. This group is also interchangeable for the most part, which is another luxury. Schroeder will play groups based on matchups. The Pioneers have to replace a lot of production on offense. Quarterback J.D. Dayhuff graduated having led Orange in passing and rushing last season. Graham Starn (senior) returns in the backfield having emerged in the middle of last season as a threat only to see his season end with an injury in Week 6. Applegate returns in the backfield as well, having picked up where Starn left off to finish second on the team in rushing and rushing touchdowns behind J.D. Dayhuff. Schroeder views J.D. Dayhuff as a big loss, no doubt, but his replacement, Luke Schmeling, is a senior who has spent a couple of seasons on the varsity roster and should plug into the position nicely. Robbie Dayhuff and Spencer Hawkins (sophomore) will back Schmeling up at quarterback. Manny Anderson (senior), Kofi Ansah-Tutu (senior) and Ryan Forbes (senior) lead the way out wide. Schroeder called Jordan Shelton (senior) his swiss-army knife because Shelton will spend time out wide, in the backfield and at tight end. Rodgers could pitch in as a slot and Harrison and Hill will see time at tight end. Gadrim (left tackle), Jake Zinn (senior/center) and Nathan Parker (senior/right guard) each return and Ryan Duffy (junior/right tackle) and Zach Stevenson (junior/left guard) fill out the line. Jeff Sullivan (sophomore/tackle) will see time as well. Luke Long (senior) and Alasti round out the backfield at fullback, but each could see time on the offensive line if needed. On special teams, Schmeling will punt, Grant Simon (senior) takes over the place-kicking duties full time and Trent Grotelueschen (senior) will be the long-snapper. The Pioneers face the exact same schedule as last season with the sites flipped. Highlights include trips to county-rival Big Walnut (Sept. 15), district-rival Olentangy (Oct. 6) and a home-finale against district-rival Liberty (Oct. 20). Orange opens at Worthington Kilbourne Aug. 25, looking to avenge a 29-28 overtime loss in last season’s opener, which was the second time in as many years the Wolves won in the extra frame. The Pioneers open the home schedule looking to avenge a 14-7 loss to Dublin Jerome in Week 3 last season. The Celtics visit Sept. 8. Orange will be featured on Thursday night for the second season in a row at home against Westerville Central Oct. 12. Newark (Sept. 22) and Westerville North (Sept. 29) round out the home slate and Bishop Watterson (Sept. 1) and Westerville South (Oct. 27) are road games this season. All of Orange’s games will have a 7 p.m. kickoff. 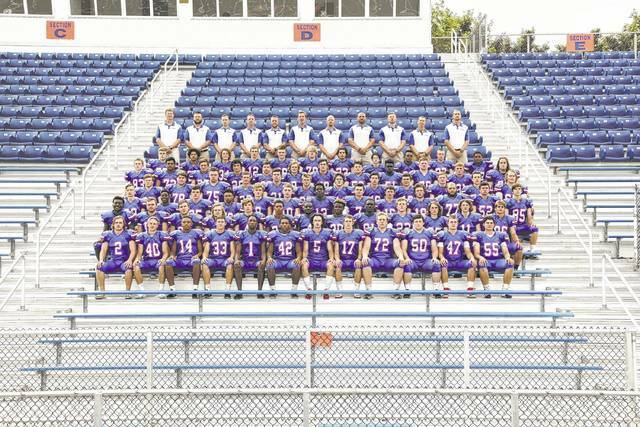 The 2017 Olentangy Orange varsity football team. Follow Michael Rich on Twitter @mrichnotwealthy and contact him at mrichnotwealthy@gmail.com.